Being environmentally-conscious and client-focused starts at the top, and Ben Dyer leads by example. His unwavering dedication to do the right thing on every project influences every other person in the company. Ben founded DC Green, LLC with the premise that the construction process should focus on the client’s needs and incorporate sustainable principles when possible. He has overseen the construction of more than 750,000 square feet of space at an estimated value exceeding $80 million for projects ranging from pre-engineered buildings to large mixed-use projects. He began his career as a Project Engineer and Assistant Superintendent on large commercial and mixed-use projects for Bluewater Builders. He then became Project Manager for Ocean Gate General Contractors to expand his abilities to include hard-bid projects, government-sponsored work, and all phases of construction. 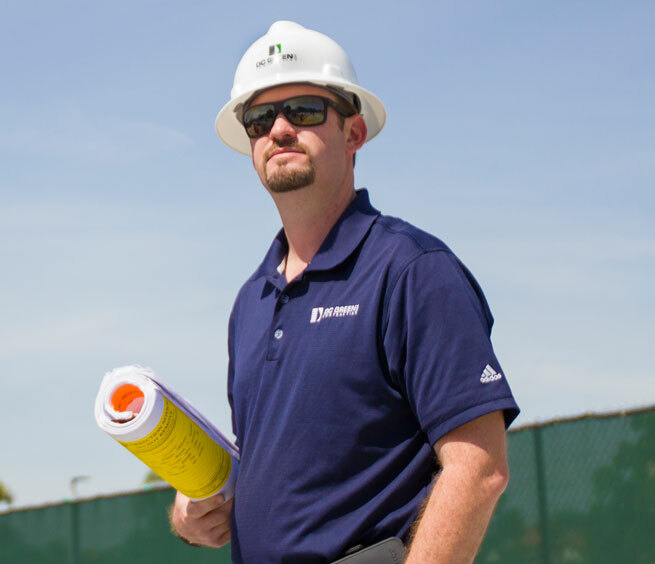 Born and raised in Florida, Ben attended the University of Florida, Rinker School of Building Construction, where he earned a Bachelor of Science degree in Building Construction. An advocate of sustainable building practices, Ben also received his LEED AP designation from the United States Green Building Council (USGBC). In his spare time, Ben enjoys exploring the inland waterways of South Florida, venturing offshore and barbecuing with family and friends at his home in Palm Beach Gardens, Florida. Originally from New England, Ben comes from a family of construction contractors and has been involved in the industry since he was a teenager. Ben has consistently demonstrated his expertise, experience and leadership on a variety of construction projects. He has overseen the completion of public and private projects of all sizes, up to tens of millions of dollars. He has held various positions including Project Superintendent, Senior Project Manager, Senior Estimator and Director of Operations for companies such as American General Construction Corp., Ocean Gate General Contractors and CAM Group, LLC. Ben received his LEED AP certification from the USGBC in 2009 and is enthusiastic about the savings sustainable construction can provide DC Green’s clients and our whole society. Ben enjoys fishing, golf and spending time with his family. He lives in Jupiter, Florida, with his wife and son.